HELP WANTED Part-Time Truck Driver The MFA AgriService in Vandalia, Mo is seeking a Part Time Truck Driver. This position requires a Class A CDL. Candidates must be able to pass a DOT drug test and be qualified to drive per DOT regulations. Must have good oral and written communication skills as well as basic math skills. Must have strength and agility to maneuver equipment and be able to lift 50-100 pounds. 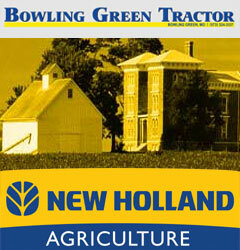 Please apply online by visiting: http://mfa-inc.com/about/careers or visit the AgriService for more information. IMMEDIATE OPENING CBC Bank, an equal opportunity employer, has an immediate opening for a full-time bank teller in our Bowling Green office. Job skills are to provide basic cash receipt and payment services in accordance with bank procedures. Proficient in math with some computer skills. Must have a high school diploma. Please respond with a resume and salary history including within the body of your email and NOT as an attachment to jack_jones@cbcbank.net. HELP WANTED Truck Driver/ Laborer The MFA AgriService in Vandalia, Mo is seeking a Truck Driver/Laborer. This position requires a Class A CDL. Candidates must be able to pass a DOT drug test and be qualified to drive per DOT regulations. Must have good oral and written communication skills as well as basic math skills. Must have strength and agility to maneuver equipment and be able to lift 50-100 pounds. Must be able to work Saturdays and overtime as needed. Please apply online by visiting: http://mfa-inc.com/about/careers or visit the AgriService for more information. STATELINE TRANSPORTERS is looking for part-time laborer for general cleaning & detailing vehicles. Must be able to lift 50 lbs. ALSO looking for full-time driver. On the road Monday-Wednesday. 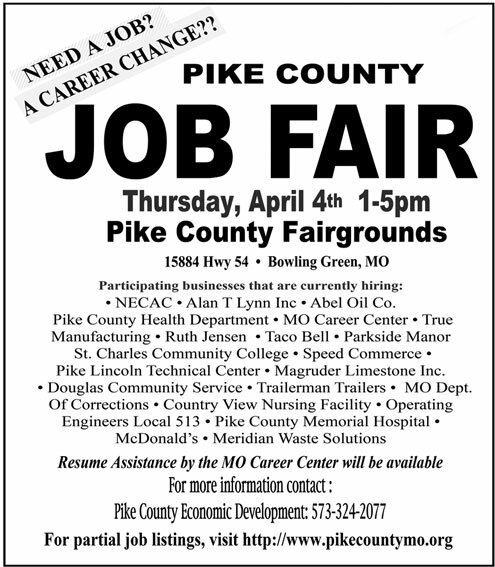 Call 573-822-5337 for more information. DAYTIME cook, dishwasher & waitress. Apply in person. Spiced Apple Cafe, 513 W. Hwy. 54, Vandalia. No phone calls please! FENCE BUILDING – Pay based on experience. Drug-free. EOE employer, 573-470-0536. B&B AUTOMOTIVE is looking for a full-time mechanic. Good pay – depends on experience. Paid vacation, inspector license a plus. Must be dependable and have good attendance. Stop by 812 W. Main, B.G. or call Jeremy , 573-470-8170. QUARRY POSITION Central Stone Company is accepting applications resumes at our Moscow Mills Quarry. Conscientious worker with a background in construction or mining is preferred. Welder/fabrication skills and experience operating heavy equipment is desired. This job will require working outdoors in all weather conditions and working overtime and weekends as needed. We offer a competitive wage and benefit package. Pre-employment drug screen, physical and background check required. Central Stone Company is an EO/Affirmative Action employer for all including Women, Minorities, Veterans, and Individuals with disabilities. Applications or resumes received by April 17, 2019 will be considered. Apply in person at Central Stone Company, 2181 West Outer Hwy. 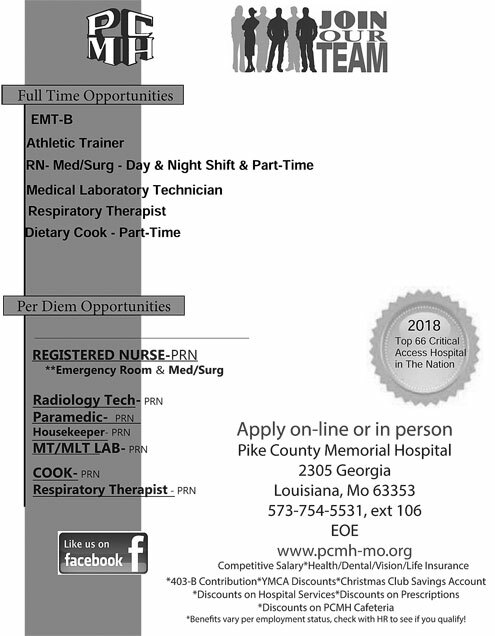 61, Moscow Mills, MO 63362, Mon.-Fri. between 8 a.m. and 3 p.m. or mail your resume to the address listed.